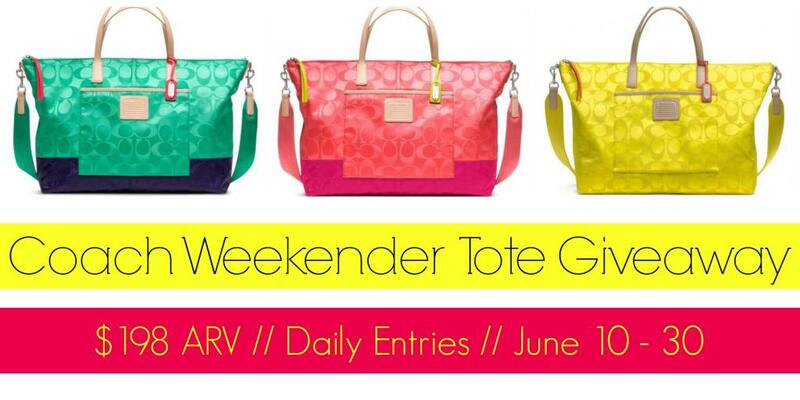 Welcome to the Coach Weekender Tote Giveaway! 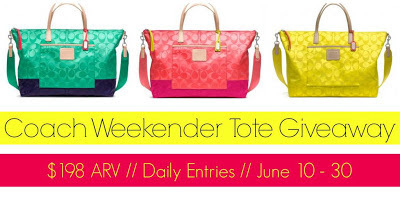 I have teamed up with some fabulous blogger friends to bring you the chance to win a gorgeous Coach Legacy Weekend Signature Nylon Weekender Tote ($198 ARV) in your choice of color! P.S. If you’re the winner and you want something besides the Coach Weekender Tote you can opt for a Coach Gift Card of equal value. Giveaway is open worldwide and ends June 30th at 11:59 PM EST. Oh My Gosh Beck! is responsible for prize fulfillment. Comment entry is the only mandatory entry, all other entries are optional. Good luck everyone! I would go to Las Vegas. Love this giveaway! I would love to go to the Hilton Waikoloa on the Big Island. I'd head to the Florida keys with this tote! We already have a weekend getaway to San Francisco planned for late July. Thanks! If I could go away for the weekend, I'd go to Key West! I would drive up the east coast to Maine. I would go to the sea-beaches of South India. I would go to Hershey,sweetest place on Earth! I would go to San Diego and maybe Mexico. I d take a fly to Singapour! I would go to Las Vegas for the weekend. I'd go to Ocean City and hang out on the beach. I just found your website and love it!!! This coach bag looks amazing and would be great summer bag. i would go to charlotte north carolina for the weekend. Ideally, I'd love to go to Paris, France, but that is too far away to go for the weekend. I'd probably opt for Maine, as that is the only New England state I've never been to, and I love lobster, so this is great! I would go to Disneyland! I want to go to ST. Louis with the entire family, JUST to spend days at the City Museum. I think that place is one of THE best most fun places in the whole world! I'd like to go to NYC to see a show. I am away right now! But my husband and I have another quick trip coming up. We are staff at a race out west, and on the way home we are sneaking in 2 days in Vegas to see some Cirque du Soleil and enjoy being away from PCs. Hmm, not far from my baby. So maybe just down to the Sarasota area or across the state to Cocoa Beach. I would take a weekend trip to my hometown, to visit my best friend who just had a baby! And I would give the bag to her - as a new mom, I think she deserves something special. Im traveling to much this would be a great addition! Hooray for giveaways! I would go to Italy or Costa Rica. I'd take a trip home to Pittsburgh! Boca Raton to see my best friend!! I would go to California! I'd go to Greece if I could. I would go to Orlando, Fl again. I would go to Las Vegas. I know that what stays in Vegas, but not my tote. I would visit my sister in arizona who i haven't seen in 8 years. realisticly vegas. dream world: italy. I'm not sure but I know it would have to be someplace full of relaxation for my hubby and I.
I want to take a trip to Austin TX! I would go to Portland, Oregon. Thanks for the giveaway…Santa Barbara !